Of the many great musical joys that I have experienced in my thirteen years as a writer/critic for Classical Voice of North Carolina, perhaps none has been as enjoyable, profound and revelatory as listening to numerous performances by the Borromeo String Quartet. On the other hand, of the many tasks during this time that I have dreaded the most, or feel stymied by, writing about these concerts was, and is right at this moment, probably the most frustrating. Like describing a fine wine, metaphors abound. Descriptions pour forth that may not even make any sense, and all you really want to say is that you have to taste it or hear it for yourself. Words become a blurry, warped mirror unable to convey what the composer and musicians evoked in us. So, here I am again, "reviewing" another performance by the Borromeo String Quartet, when all I really want to say is "go hear them; there is none better." Today's performance was the opening concert of the 2015-16 St. Stephen's Concert Series. Taking place at the lovely St. Stephen's Episcopal Church in Durham, these concerts have the added bonus of starting at 4 p.m. so you get the full effect of the late afternoon sun shining through the remarkable three-walled, floor-to-ceiling stained glass windows. Several respected writers on music have suggested that it takes a certain level of musical maturity to fully appreciate and understand the alleged "simplicity" of the great classical period composers. That is abundantly clear with the enormous output of string quartets by Franz Joseph Haydn. Today we heard Borromeo play Haydn's Opus 76, No.6, one of his last. Typical in form, this is anything but predictable and cookie-cutter, with harmonic movement well beyond its era. The first movement even has a fugue erupt from the principal theme – fairly common in a finale but not in the opening. The richness of the adagio, aptly also named fantasia, is mazelike in its harmonic profundity. Typical of Haydn's final movements, you'd better have your technical chops in order as you need to simultaneously fly, be controlled and also project an unbounded sense of fun. Borromeo had it all, although in a perverse sort of way I am relieved to report that there were a few very minor slip ups. Happy to report that they are human also! One of the many musical movements during the 1950s and 60s was an attempt to meld classical music with elements of jazz. One of the lead proponents of this was Gunther Schuller (1925-2015) who coined the term Third Stream music to describe this concept, which, I believe, in practice was not very successful. His String Quartet No. 4, written in memory of the violinist Felix Galimir, is not a Third Stream work. It has become a legendary quartet – recorded several times but very rarely performed live. Kitchen spoke about this work before they played and gave us a condensed roadmap of the complexities and points of interest for which to remain alert. There were also voluminous program notes, including a reprinting of Schuller's comments from Living Archive records. This is my first hearing and I was struck by the simultaneous incongruity and interlocking of styles. It has moments of tangled-yarn density followed by lovely, lyrical solos. Much of it has an eerie otherworldly quality that, depending on your philosophical bent, might evoke deep religious reflection or an appropriate soundtrack to images from the Hubble telescope. This was some of the most technically difficult music that I have heard, but each member of the Borromeo Quartet was able to transcend the thickly, crowded score (I was peeking at Kitchen's laptop as he played), to bring this unfamiliar (to most) music alive. When the quartet returned from intermission they played a brief selection that was not listed on the program. In memoriam to Mary Clyde Bugg, longtime member of the St. Stephen's congregation and choir, they played an arrangement of Brahms' organ version of "Lo, How a Rose E'er Blooming." 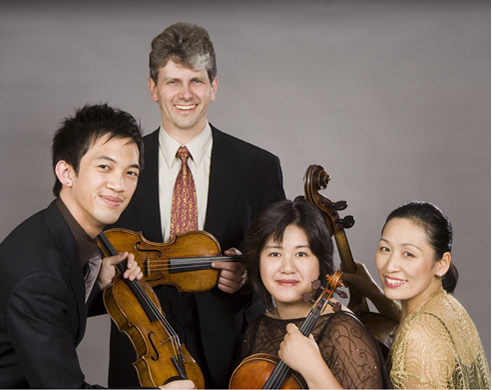 From the height of the mature classical period to a twenty-first century classic, the Borromeo Quartet, for their final work, traveled back to a quartet that is about as romantic as you can get: Tchaikovsky's String Quartet No. 1. Although titled as being in the key of D major, it has a distinctly minor-ish kind of feel, reminiscent of the "is it minor or major?" sound of much of Brahms. Written in a traditional four-movement form with your standard movement titles, this wonderful quartet is an extroverted display of infectious rhythm – with one big exception. Tchaikovsky's cache of gorgeous, memorable themes is nearly incalculable, yet the melodies in the "Andante cantabile" of this quartet can vie with the best and most tear inducing. The Borromeo Quartet gently trod the precarious line of becoming too maudlin and syrupy, and was simply direct with beautiful tone and phrasing. As in his symphonies, Tchaikovsky then brings out the big guns (or cannons) and blows you away with unbridled energy via superfast and very loud playing. So, mark my words – or ignore them – and just do it, i.e., go hear the Borromeo String Quartet, easily one of the best there is. Unfortunately, this is their only Durham appearance this concert year. However, Kitchen and Kim will give a concert at St. Stephen's on November 29.